On January 19, two national non-profits, Animal Legal Defense Fund and Best Friends Animal Society, jointly filed a petition for rulemaking with the Indiana Natural Resources Commission, arguing that the Department of Natural Resources misinterpreted state law regarding animal cruelty at Ohio County’s annual Snapperfest. Indiana Code 35-46-3-12 states that “a person who knowingly or intentionally beats a vertebrate animal commits cruelty to an animal, a Class A misdemeanor.” Because the snapping turtle is one of three designated a game species in Indiana (along with the smooth softshell and spiny softshell), the DNR believe that the state’s animal cruelty law isn’t applicable in this instance because it provides an exemption for wild animals that are legally taken and possessed. Dillard says the DNR has condoned the event by stating that Snapperfest participants are exempt from anti-cruelty law under the exception for hunting and trapping, because they claim the turtles were trapped prior to their mistreatment at Snapperfest. Furthermore, ALDF claims that DNR is not doing its job. 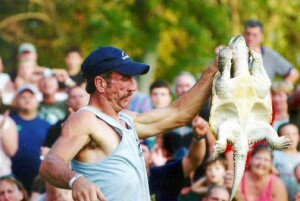 Fun festival or turtle torture? The competition consists of timing men on how quickly they can pull a snapping turtle from a tub of murky water, run across a lawn and force – or, as Reeves describes it, “coax” – its head out of its shell far enough to grab it by its neck. Women are timed in a relay race to carry a soft-shell turtle across a lawn. Undercover video shows a man slamming a turtle onto a mat, grabbing its head, stretching its neck and kissing it on the nose. Other videos show men using their knees to hold the turtles down or carrying them by their tails, and women dropping turtles while they run. Carrying a turtle by the neck could break its windpipe, esophagus and vertebrae. 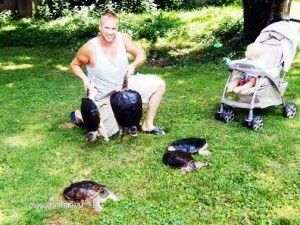 Moving a turtle too quickly or roughly can cause intestinal injuries. Dropping a turtle can injure its skeletal system, particularly its legs and neck. It could also cause jaw or facial injuries. “If there is a recent, unhealed injury to the shell, it can make the injury worse by increasing the fracture or splitting a soft area that is healing,” La Prees adds. A turtle’s shell is living tissue and can feel pain. Cuts and tears can occur to the outer edges of the softshell turtles’ shells; fractures to bones located near the center of the shell are possible. Skin infections can result from soft tissue exposure. Digging their fingers into the soft tissue to extract the turtle’s head could cause neck, eye and/or nose injuries. Because they are cold-blooded with slow metabolism, turtles are slow healers. “Returning injured or sick turtles to the wild is tragic,” says La Prees, who recommends that fractures be treated by a qualified exotic veterinarian prior to rehabilitation. Broken bones will disable a turtle, making it easy prey or leading to drowning if it cannot move properly through water. Eye injuries will render it unable to find food. Further stress is caused due to the fact the turtle is unable to function normally. Lines have been clearly drawn. For the past 15 years, the event has been held at Campshore Campground, a private facility on the Ohio River near Rising Star Casino, but widespread protest against Snapperfest in 2011 generated a great deal of negative attention. Sizemore’s assertion that the police told him they’re “not doing anything wrong” is substantiated by Ohio County Auditor Connie Smith, who says, “The cops say they’re not breaking any laws.” Aurora Police Chief Bryan Field said in a statement that the event falls outside of the jurisdiction of the Aurora Police Department.